Jojoba (Simmondsia chinensis (Link) C. K. Schneid.) is a shrub native to Northern Mexico and the South-Western USA, which has become a minor oil crop since the 1980s. Its seeds contain a liquid wax similar to spermwhale oil (spermaceti) in composition with properties that have numerous industrial uses. Jojoba is an evergreen shrub. In humid areas, the plant may grow up to a height of 3 m, whereas in arid areas it remains in a semi-prostrate form as a low mound of 20-50 cm in height. Several stems arise from the root crown. In full light, lateral branching is prolific near the base. As the plant ages, the lower foliage is pruned by the shade and a high canopy develops. The bark is smooth. The leaves are thick and leathery, 2-4 cm long, vertically oriented to reduce exposure to the sun. Jojoba leaves may be shed during severe drought, but generally live for two or three seasons depending on moisture and shade conditions. Jojoba is considered to be drought-resistant, and physiologically active the entire year. Jojoba has male and female flowers, the former usually solitary and the latter grouped in dense clusters. Jojoba fruits are dehiscent capsules containing 1 and more rarely 2 or 3 large (1.5-3 cm) acorn-like seeds, light brown to black in colour. Jojoba may have several taproots that have been observed at depths of 10 m. The life span of jojoba is over 100 years and may exceed 200 years (Matthews, 1994). Jojoba seeds contain approximately 50% oil, which is actually a wax made of long chain monoesters of C20 and C22 fatty acids and alcohols with almost no triglycerides. Jojoba oil is light yellow in colour, odourless, and outstandingly stable. It never becomes rancid, and withstood repeated heating at between 295°C and 380°C over four days without alteration. It does not need much refining (El Bassam, 2010). Jojoba oil has many industrial uses as a lubricant in mechanical systems that involve high pressures and temperatures. It is also much valued in creams, polishes and cosmetics (El Bassam, 2010). The production of jojoba oil bloomed after the 1982 moratorium against whaling, as it replaced spermaceti (whale oil) that had been used to make wax candles, other illuminants and lubricants (Duke, 1983). However, the production of jojoba oil seems to have remained relatively low after this period, but the figures are not consistent (El Bassam, 2010; IWC, 1982). The seeds were formerly ground and cooked to make coffee substitutes. Jojoba was reported to have many ethnomedicinal and cosmetic applications by the Indian tribes of Mexico (Duke, 1983). Jojoba produces palatable forage for livestock. The oil meal resulting from oil extraction can be used as fodder but it contains antinutritional factors and needs to be detoxified. 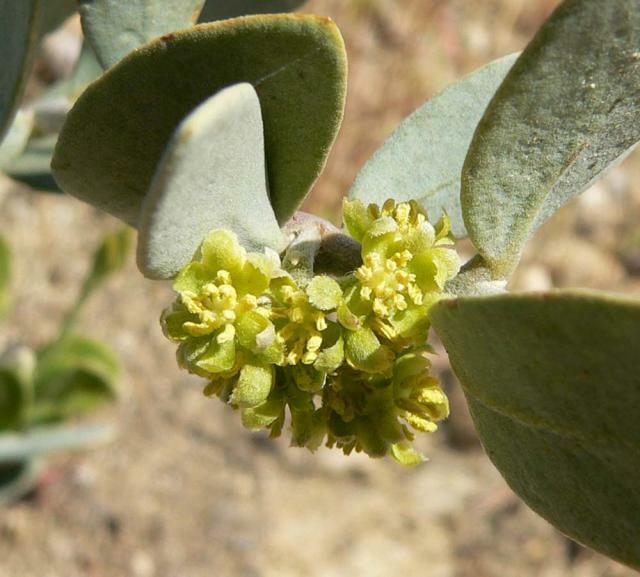 Because of the limited expansion of the jojoba oil market, jojoba foliage and jojoba oil meal are not currently very important resources for livestock feeding. 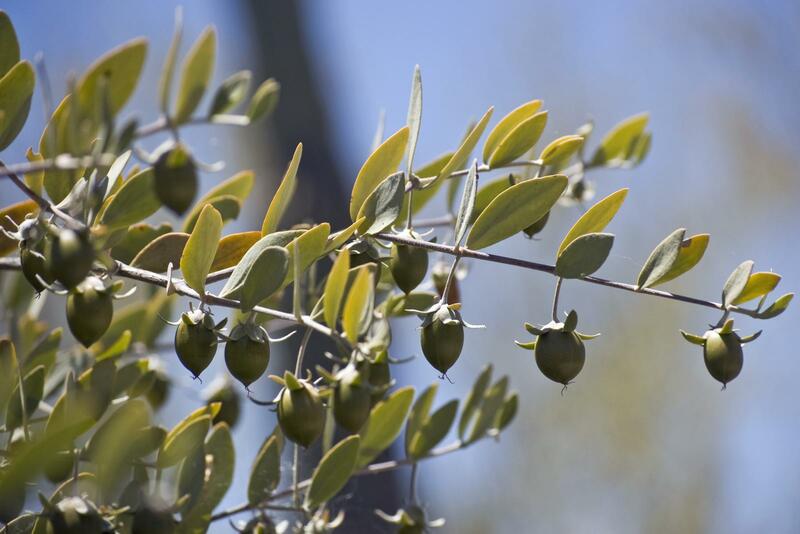 Jojoba is native to Northern Mexico, Southern California, New Mexico and Arizona. It is cultivated mainly in Arizona, northern Mexico, Argentina and Israel. there is some small-scale planting in Australia, Chile and India (Benzioni, 1997 cited by El Bassam, 2010). In nature, jojoba is found from 23 to 34°N in warm temperate desert and tropical desert forest areas, from sea level up to an altitude of 1500 m. It can grow in places where annual rainfall ranges from 200 mm to 2000 mm and temperatures are between 0°C and 47°C (El Bassam, 2010; Duke, 1983). It does best with a rainfall between 300 and 750 mm. Jojoba requires a two-month cool period of around 15°C to ensure flowering. It is frost sensitive when young but the mature shrub can survive -10°C. Jojoba grows well in a vast range of soils, including marginal ones, provided they are well-drained. It has some tolerance to salinity but not to waterlogging. Jojoba does well under intense sunshine and dry conditions (El Bassam, 2010; Duke, 1983). 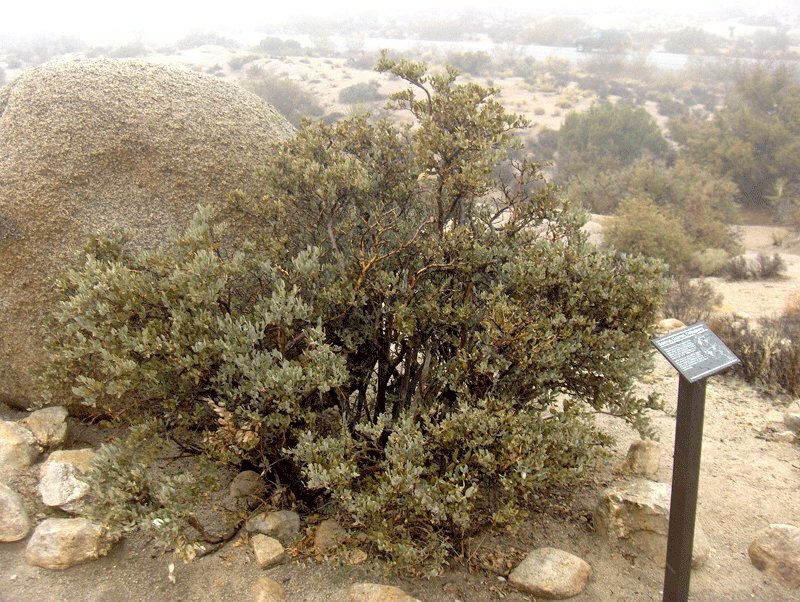 Jojoba can form dense stands on rocky slopes. After fire jojoba is valued for its ability to quickly regrow from the root with dense stands taking less than 10 years to re-establish (Matthews, 1994). In the 2010s, the main producers of jojoba oil were the USA, Mexico, Costa Rica, Australia, Brazil and Paraguay (El Bassam, 2010). There are also commercial plantations in Argentina, Egypt, Israel and Peru (El Bassam, 2010). The total area covered by the crop worldwide in 2002 was about 8500 ha, whereas it was about 8000 ha in the South-Western USA in the 1980s (El Bassam, 2010; Undersander et al., 1990). In 1999-2001, Israel produced a third of global production of jojoba, with average yields of about 3.5 t/ha (the potential yield is 4.5 t/ha) (El Bassam, 2010). Jojoba can be propagated from seeds or cuttings. Cuttings offer better homogeneity in the stands and also allow planting of the optimum ratio of male:female plants (1:10) for pollination and fruit production (El Bassam, 2010). Young jojoba plants require watering during the first two years of cultivation. Weeding the stands is necessary for stand establishment. It can be profitably intercropped with other species that will prevent weeds (Duke, 1983). Jojoba starts producing fruits within 4 years and is in full production after 10 years. In Israel, some stands produced fruits after only 3 years. Jojoba remains productive for 100-200 years. Seed yield ranges from 2.5 t/ha to 4.5 t/ha. As the foliage is readily grazed or eaten by rodents, fencing the stand is advisable (Modise, 2007; Goodin et al., 1979). 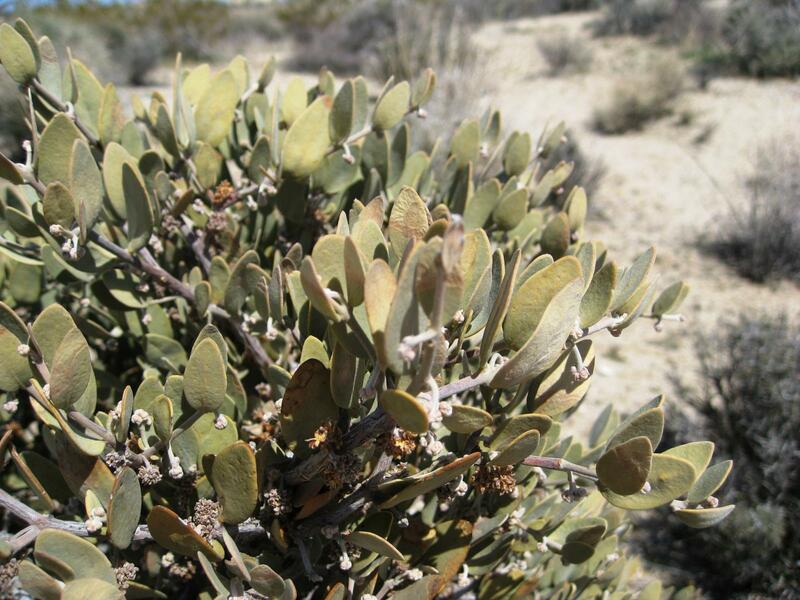 Jojoba plants have been used for afforestation purpose in arid areas of Mexico and Israel (Orwa et al., 2009). They are valuable after fire (Matthews, 1994). Jojoba foliage is relatively poor in protein (7-13% DM) and moderately rich in fibre (ADF 24-39% DM). However, in its native area, it is considered as a very nutritious forage for livestock and wildlife. Its quality remains relatively constant throughout the year, even though it may peak at certain times of the year. New growth is generally of higher value than old plant material (Matthews, 1994). Jojoba oil meal is a variable by-product whose composition depends on the efficiency of oil extraction and on the presence of seed hulls. As a consequence, protein concentration varies from 20% to more than 30% DM, and oil content varies from less than 1% to more than 15% DM. Crude fibre content ranges from 8 to 15% DM. The protein of jojoba is relatively rich in lysine (about 6% of the protein). However, despite its nutritional qualities, the utilisation of jojoba oil meal in livestock feeding is hampered by the presence of toxic substances and this product must be either detoxified or used in very limited amounts. Seeds contain high levels of simmondsin and simmondsin analogues (Verbiscar et al., 1978; Medina et al., 1990). Simmondsins are cyanoglucosides that are highly toxic to rats, mice, rabbits and sheep. In rats, simmondsin has a LD 50 of 4 g/kg (Medina et al., 1990). The seed meal obtained after oil extraction is mostly discarded and not currently used in animal feeding because it still contains simmondsin (Abbott et al., 1990; Lein et al., 2002). Jojoba also contains phenolic compounds and has a bitter taste. Several processes and treatments have been tested, including fungus, lactic bacteria, heat, ammonia, isopropanol and other chemicals, in order to alleviate problems due to these antinutritional factors (Verbiscar et al., 1980; Medina et al., 1990; Wisniak, 1994; Khalel et al., 2008). Jojoba foliage is a browse resource that is relished by cattle, rabbits, goats and deer (hence the names "goat nut" and "deer nut") (Matthews, 1994; Duke, 1983). In the South-Western USA, jojoba is particularly important for mule deer (Odocoileus hemionus) in autumn and winter. Cattle may browse jojoba severely enough to prevent any fruit development, and often consume it faster than it grows (Matthews, 1994). There is little information available in the literature about the nutritional value of jojoba forage for ruminants. Reported values of in vitro DM digestibility are low, in the 36-47% range (Matthews, 1994). Due to the presence of simmondsin and other antinutritional factors, jojoba oil meal has deleterious effects on DM intake and sometimes on performance (growth) in ruminants when included in the diet at more than 10%, even though rumen microorganisms have been shown to detoxify 95% of the simmondsin within 6 h in sheep (Manos et al., 1986; Verbiscar et al., 1980). When jojoba meal is detoxified by physical, chemical or bacterial treatments, it becomes possible to include it at up to 30% of the diet without affecting DM intake and performance. Jojoba oil meal is not very palatable to ruminants. Steers offered a pelleted diet with or without 10% jojoba meal preferred the pellets without (Verbiscar et al., 1981). Lambs that could choose their diet freely refused the diet containing untreated jojoba meal, while lambs given no option ate only 50% of their normal intake (Verbiscar et al., 1980). Jojoba oil meal ensiled with chopped maize plants was largely rejected by lambs when the meal was included at 20% in the silage, but they ate normally when 5 and 10% meal was included (Manos et al., 1986). Steers fed a diet containing 10% detoxified jojoba oil meal had the same DM intake but a lower weight gain (by 16%) than steers fed a control diet without jojoba meal (Verbiscar et al., 1980). Jojoba oil meal included at 10, 20 or 30% in a concentrate offered with bean straw to growing lambs (20.8 kg) for 98 days did not alter DM intake but daily weight gain was depressed (46-97 g/d vs. 216 g/d without jojoba meal), although DM digestibility tended to increase with increasing jojoba levels. Lambs fed with high jojoba level showed higher liver enzyme levels indicating liver and other tissue problems (El-Kady et al., 2008). Jojoba meal added at 20 or 30% in lamb diets decreased DM intake by about 50% and did not support any weight gain. Animals fed with 20 or 30% untreated jojoba meal did not show differences in their organs or pathology compared to control lambs (Verbiscar et al., 1980). Untreated jojoba meal included at 10% of the diet, or detoxified jojoba meal included at 10 or 30% of the diet had no effect on DM intake and growth (Verbiscar et al., 1980; Verbiscar et al., 1981). Jojoba meal treated with fungus and included at 10% in a concentrate improved DM and OM digestibility, and increased daily weight gain (Khalel et al., 2008). When jojoba oil meal was included at 0, 5 or 10% in a complete diet and fed ad libitum to Creole dairy goats, DM intake decreased from 2.6 to 2.2 kg as jojoba level increased, with no effect on weight gain (184-221 g/d), although it tended to be lower (184 g/d) with 10% jojoba. Milk yield was higher with 5% jojoba (428 ml/d) than with 0% (270 ml/d) or 10% (196 ml/d), but there was no effect on milk composition. The 5% inclusion level gave the best performance (Azocar et al., 1990). The proximate composition of jojoba oil meal suggests a good nutritional value but its antinutritional factors considerably limit its use in poultry diets. It is recommended to avoid using jojoba oil meal in broiler diets, unless an appropriate treatment has been tested with success. Untreated jojoba oil meal included at 5 and 10% of the diet fed to broilers significantly decreased growth performance, resulting in a weight loss of 20% and 80%, respectively, at 4 weeks of age (Ngou Ngoupayou et al., 1982). Feed intake was also reduced, as a combined consequence of lower growth and poor palatability (Vermaut et al., 1997). Though they alleviated the negative effect of jojoba meal, processes such as boiling or treatment with ammonia or ammoniated hydrogen peroxide did not support a growth similar to that of a control diet without jojoba meal (Ngou Ngoupayou et al., 1982). Treatment with Lactobacillus acidophilus resulted in performance that was still lower than with the control diet. However, 4 to 10% jojoba meal in the diet, treated with boiling water followed by solvent extraction, maintained or increased growth compared to that from a maize/soybean meal control diet (Shamma et al., 2014). In layers, performance was much decreased with the use of jojoba meal in the diet (Ngou Ngoupayou, 1982). In breeders, jojoba meal reduced both the laying rate and the egg size (Vermaut et al., 1999). Several physiological effects on reproductive function were observed, including a decrease in ovary and oviduct weights. It is, therefore, strongly recommended to avoid jojoba oil meal in diets for breeders. In some experiments, jojoba oil meal has been included in breeder pullet diets in order to control the growth curve by reducing feed intake without quantitative feed restriction (Arnouts et al., 1993). In practice, the feed consumption was higher than control for a given growth rate, or the growth rate lower than from the control diet when the birds had the same feed intake, indicating a lower feed efficiency. The reduced feed intake observed with jojoba oil meal suggested that it could be used to stimulate moulting (Vermaut et al., 1998). This experiment led to the conclusion that 12% jojoba meal could be a way to induce moulting, with no subsequent effects on development of the oviduct. However this technique has to be implemented carefully due to the risks associated with jojoba oil meal. In Arizona, jojoba shrubs are grazed in the wild by cottontail rabbits (Sylvilagus audubonii) and jackrabbits (Lepus californicus) that live near jojoba plantations (Baker, 1990). However, jojoba is generally considered in Arizona as resistant to browsing by rabbits (Schalau, 2010). More information is, therefore, needed before jojoba foliage can be recommended for rabbit feeding. Jojoba oil meal is rich in protein with a relatively low fibre content, but the presence of simmondsin and other antinutritional factors makes it detrimental to rabbit performance. Several experiments show that jojoba meal should never be used in rabbit feeding unless it has undergone an efficient detoxification process. Feeding growing rabbits with untreated jojoba oil meal at 5, 10 or 15% of the diet resulted in a significant reduction in growth even at the 5% level, but no deaths were recorded (Ngou Ngoupayou, 1982). Processing the meal to reduce simmondsin to only 1.3% was insufficient to alleviate the reduction of feed intake and the consequent reduction in growth. Processing jojoba oil meal with a specific Lactobacillus strain level reduced the simmondsin to 0.34% and resulted in feed intake and growth rate similar to those obtained with the control diet without jojoba oil meal (Ngou Ngoupayou, 1982). In Egypt, treatments with fungus, lactic acid bacteria, isopropanol or heat were all shown to reduce the simmondsin to less than 0.26%. The 4 methods were able to eliminate the harmful effect of the antinutritional factors and including the processed jojoba oil meal at 10% in rabbit diets was feasible. The fungus and the bacteria processes gave the best growth rates (Khayyal et al., 2009). The low digestibility of some essential amino acids, such as lysine or sulphur-containing amino acids, must be recognized (Ngou Ngoupayou, 1982; Ngou Ngoupayou et al., 1985). The addition of jojoba oil to rabbit diets (2-3%) is well tolerated and tends to reduce the serum cholesterol level. The presence of residual oil in jojoba oil meal could, therefore, have a beneficial effect on rabbit health (Clarke et al., 1981; Karam, 2014). In Egypt, jojoba oil meal replaced 25% of the fish meal in diets for Nile Tilapia fingerlings. Growth, nutrient utilization, plasma globulin, area and diameter muscular bundles in fish dorsal muscles were all increased compared to those receiving a control diet (Khalil et al., 2009). Increasing jojoba oil meal in fingerling diets, replacing 50, 75 or 100% of the fish meal had some effects on carcass composition (lower protein in fish muscle and higher fat content at 75% replacement; higher ash content at 100% replacement) (Labib et al., 2012). Cardoso, F. A., 1980. Extraction, characterization and functional properties of jojoba proteins. PhD Dissertation, University of Arizona, 77 p.
Matthews, R. F., 1994. Simmondsia chinensis. In: Fire Effects Info. Syst., [Online]. USDA, Forest Service, Rocky Mountain Res. Station, Fire Sci. Lab. Modise, D. M., 2007. Simmondsia chinensis (Link) C.K.Schneid.. In: van der Vossen, H.A.M. ; Mkamilo, G.S. (Eds). PROTA 14: Vegetable oils/Oléagineux. PROTA, Wageningen, Netherlands. Ngou Ngoupayou, J. D., 1982. Nutritional evaluation of jojoba meal. In: PhD Thesis, University of Arizona, 82 p.
Schalau, J., 2010. Deer and rabbit resistant plants. Arizona Coop. Ext., Univ. Arizona , College of Agric. Life Sci., Paper AZ1237, 2 pp.